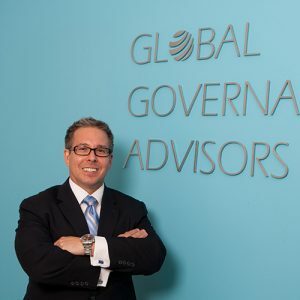 Bradley Kelly is a Partner of Global Governance Advisors. With extensive experience in strategic planning in large complex organizations, Brad works with board members and managers to devise innovative executive compensation and governance solutions to existing or anticipated challenges. Brad specializes in performance goal setting, strategic review, valuation and the innovative design of executive compensation and corporate governance programs that help focus and support organizational strategic objectives, as well as stakeholders’ interests. As well, Brad is certified in the assessment of leadership behaviours and skills, as well as the assessment of organizational governance effectiveness. Having spent a number of years as a Senior Consultant in Hay Group’s Executive Compensation Practice, Brad had the opportunity to represent stakeholder interests and advise the boards of a wide range of organizations – from public to private and from large, established, financial institutions to new corporate or industrial start-ups. Prior to this, Brad spent close to a decade working in the Federal Public Service where he developed a strong knowledge of complex institutions and their needs. Working at the Treasury Board Secretariat of Canada as a program analyst, Brad specialized in performance management and strategic planning – guiding federal executives and organizations through annual performance planning cycles. Following that, Brad became a senior policy analyst and strategic planner at Industry Canada where he focused on organizational renewal, succession planning and management retention. In addition, while at Industry Canada, Brad led the development of broad, national, strategic plans and innovative enterprise-wide policies. Currently Brad is a course developer and lecturer for the Accredited Executive Compensation Program, is frequently asked to present to boards, professional associations and conferences, and regularly publishes articles in numerous professional journals and magazines. As well, Brad is a member of the Board of Directors at Altruvest Charitable Services – a not-for-profit organization with a mission to foster more effective charities and stronger communities by expanding the talent pool, and enhancing the governance skills of charitable sector boards and senior leaders. Brad is a Masters of Public Administration graduate of Carleton’s School of Public Policy and Administration. He graduated as Valedictorian at the University of Waterloo and holds Honours degrees and specializations in Political Science, Public Administration, Legal Studies, and Philosophy. Brad has studied at Harvard’s Kennedy School of Government and has received numerous awards for his work.